Ramprashad Prabhakaran, a materials science researcher in the Reactor Materials & Mechanical Design group, was selected as one of eight rising professionals to participate in the 8th Annual Emerging Leaders Alliance (ELA) Conference, held in Reston, Virginia in November 2015. The Minerals, Metals and Materials Society (TMS) selected Prabhakaran from among a pool of over 1,300 young members. TMS is a professional society with about 13,000 members from 94 countries. Prabhakaran attended the ELA-sponsored conference along with 80 young leaders from all over the world. ELA serves as a leadership training program for engineers and scientists, providing the opportunity for professionals to share knowledge and interact across disciplines. "I feel that the breadth and depth of the topics covered by this conference, coupled with the stimulating group activities with the rising professionals selected from various sectors and countries, seems to be the right combination for further enhancing my leadership and interdisciplinary skills, and to gain invaluable international exposure," Prabhakaran said. "This is precisely the kind of experience that I was looking for that will further guide me and hone my skills to be one of the major leaders within the various organizations (PNNL and various professional societies) that I represent." 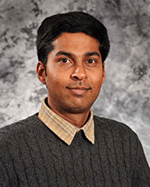 In addition to being named a TMS rising professional, Prabhakaran's previous accomplishments include winning a 2015 TMS Structural Materials Division Young Leader Professional Development Award, serving as Guest Editor and Journal Advisor for two years for the TMS Nuclear Materials Committee, chairing the TMS Nuclear Materials Committee board, serving on TMS Administrative Committees (Programming and Professional Development), and taking on the role of Lead Organizer of the TMS Symposia on Nuclear Fuels & Materials for five consecutive years. At PNNL, Prabhakaran has refined his leadership skills by leading projects and coordinating with project members across the spectrum, from machinists to senior engineers.